063, originally uploaded by SewLaTea. Mistake #1: step #5: “5. Place lining fabric inside the outside fabric right sides together.” ok. this should have made PERFECT sense, but my pregnant mushy brain interpreted it wrong. I put the lining fabric right sides together, INSIDE the outside fabric which was also right sides together. duh. 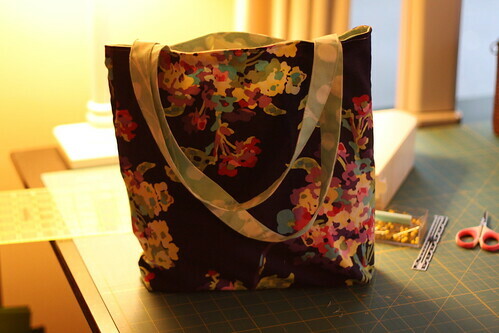 what I SHOULD have done was put the right side of the lining facing the right side of the outside fabric…. Mistake #2. After ripping out all the seams and turning the bag inside out, I realized again I misread directions. The handles somehow were still inside the bag, not outside like they should be. The directions state: step #6: “Place straps in between right sides of fabric on each side about two to three inches from the side edge.” I don’t know HOW I messed this one up….I totally missed BETWEEN right sides…and had placed them on the inside of the lining….the middle of the bag, not the middle of the layers…duh again. Had to take out the seam ripper AGAIN…not a happy girl.